As marketers, we often hear the old adage that it is five times more expensive to gain a new customer than it is to retain an existing one. This stat has been circulating since the 1980s, but didn’t take hold in the industry until July 1990, when the Harvard Business Review cited the five times figure in an article. Though the accuracy of the stat is often called into question, the underlying principal — it’s cheaper to keep your existing customers happy than to continuously pump marketing dollars into chasing their replacements — is fundamentally sound. This is the same core tenet that has driven much of our work at MarketingExperiments over the years. We believe in the transformational power of customer-first thinking, and hold that companies should shift their focus from the cost of pleasing customers to the value of doing so. In the same Harvard Business Review article — “The Profitable Art of Service Recovery” by Christopher Hart, James Heskett and W. Earl Sasser, Jr. — formally introduced the concept of “service recovery.” Service recovery refers to the retention strategies that we implement when customers’ perceptions of or experiences with our particular services do not match their expectations. While the traditional business model primarily emphasizes monetary benchmarks — revenue, profit margins, return on investment — the recovery model holds customer satisfaction as the most fundamentally important KPI of all. A study conducted for the U.S. Office of Consumer Affairs once found that 70% of U.S. households would maintain brand loyalty if their problems were resolved satisfactorily at the time they arose, adding credibility to the importance of this KPI. In short, putting the customer first and quickly and honestly addressing their concerns fosters loyalty, even when errors are inevitably made. For an example of service recovery in action, let’s take a look at Audible. 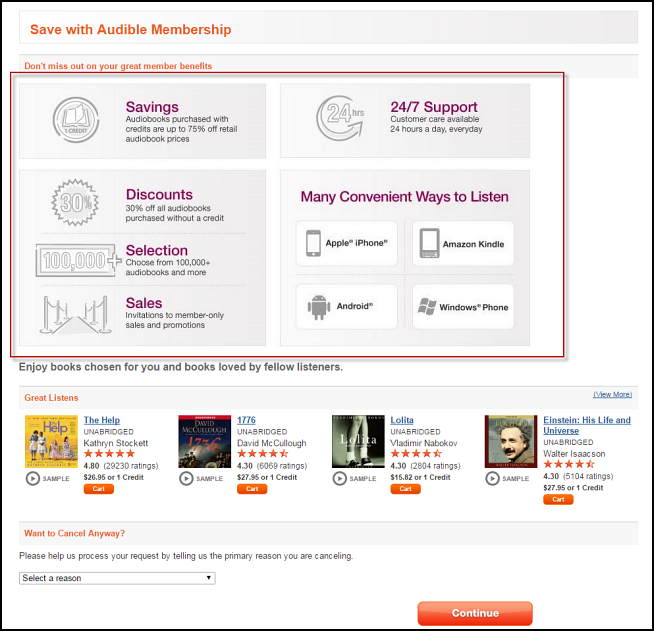 Audible, America’s leading seller of Audiobooks, leverages these service recovery principals effectively by integrating a customer-centric retention strategy directly into its cancellation path. I personally discovered this last week when I entered the path with the intent to cancel my membership and instead wound up being convinced to subscribe for three more months. Though this concept certainly isn’t unique to Audible, it is a great example of a company that does retention well by harnessing three simple techniques within the failure path. 1. Reinforce the value: When initiating a cancellation, the first page that Audible directs users to provides a brief overview of the value that the service provides. Audible’s exclusive discounts (“Audiobooks purchased with credits are up to 75% off retail audiobook prices”), extensive library (“choose from 100,000+ audiobooks), 24/7 customer support and ease-of-use (cross-platform support) are emphasized. 2. Address Specific Customer Complaints: If customers still wish to move forward with their cancellation, they must select a reason for their decision and then press the continue button. The company uses the below dropdown menu to quickly determine why a user has decided to terminate their membership. Choices range from technical issues and cost to device incompatibility and more. By diagnosing the specific problem, Audible can quickly shift into service recovery mode. Based on their choices in the dropdown menu, customers are then redirected to specific retention pages addressing their concerns. For example, if a customer is having trouble getting Audible to work properly, instead of being automatically pushed forward through the cancellation pipeline, they would sidestep to the below page, providing 24-hour phone numbers where users can quickly get support for their problems. Audible is quick to point out that most technical problems can be solved easily with the help of a representative. If a customer is having trouble using Audible because their device isn’t compatible with the service, they would be redirected to a different page, where a customer service representative may be able to walk them through an alternate process to get Audible to work on their device. “There’s a good chance we can solve your problem quickly and completely,” Audible promises on this page. In my case, canceling Audible came down a pure cost-benefit analysis. Even though I like Audible and am easily able to find a new book to download each month, I’ve had a busy summer and simply wasn’t using the service enough to justify the price. For $15 a month, Audible is less of an impulse buy than my other sub-$10 offerings like Netflix, Spotify and Hulu Plus. Right when I was ready to cancel, Audible directed me to the below offer. For only $7.49 a month, I could continue my subscription for three more months. I was already on the fence about canceling, and the reduced price was just what I needed to continue my subscription while I further evaluated the benefits of the service. 3. Incentivize Retention: If the corrective measures used above do not work and customers still choose to continue the cancellation process, Audible leverages short-term price discrimination, making the 50% off discount for three-months available to all customers as a final win back attempt, regardless of their choice in the dropdown menu. Though the temporary price decrease risks weakening Audible’s value proposition at full price, this steep discount gives customers just on the verge of cancelling an incentive to continue with Audible for another 90 days. If they are pleased with the service they receive, they will likely remain loyal customers, even when the price returns to the full $15/month. Even with the best service recovery strategy, we can’t retain every customer. If a customer chooses to cancel, genuinely thank them for their business and leave the door open for future reactivation. Audible, for example, sends a nice personalized message thanking members for their service. The tone is personal, and appears to come from an actual human (Meredith) rather than a corporate machine. By incorporating these simple tips into our own service recovery and proactively identifying addressing user concerns, we stand the best chance of retaining loyal customers for years to come.